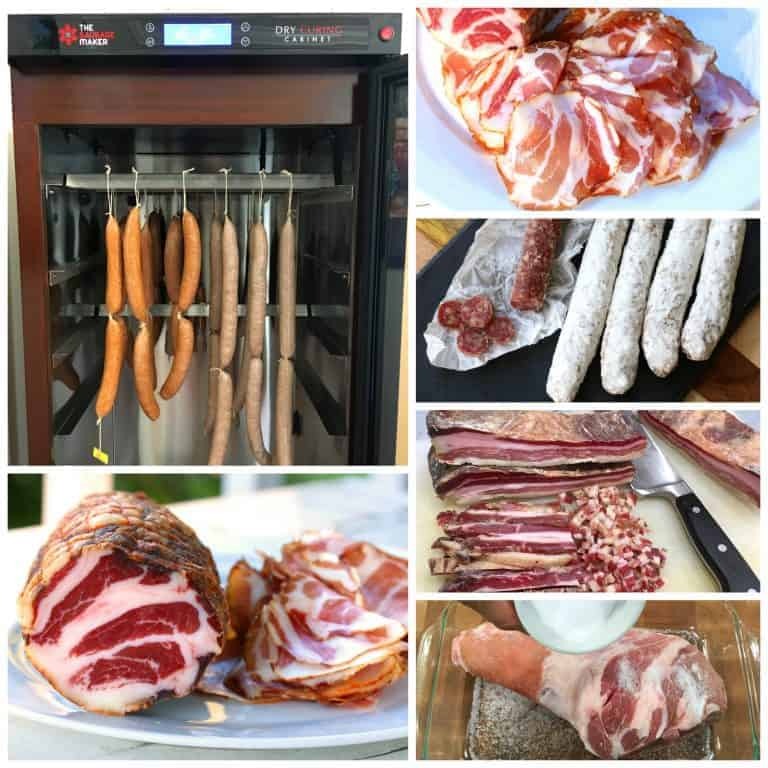 If you make your own dry-cured meats and sausages, fermented vegetables or cheese, the Digital Dry-Curing Cabinet from The Sausage Maker is a dream come true! I’ve teamed up with The Sausage Maker to bring you this post. Welcome to Part II of The Sausage Maker Digital Dry-Curing Cabinet Review! 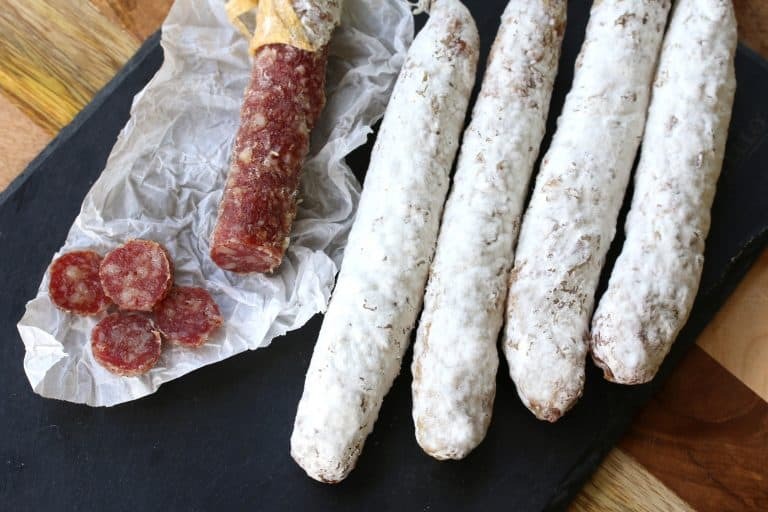 If you’re into making your own sausages, dry-cured meats, cheese, wine, sauerkraut and more, then you’ve most likely heard of The Sausage Maker, the leader in the sausage-making industry for over 40 years. What you might not know is that they’ve created the first dry-curing cabinet for home use. Whether you’re using it for dry-cured meats, fermented vegetables like sauerkraut, or cheesemaking, this dry-curing cabinet is every DIY’ers dream! 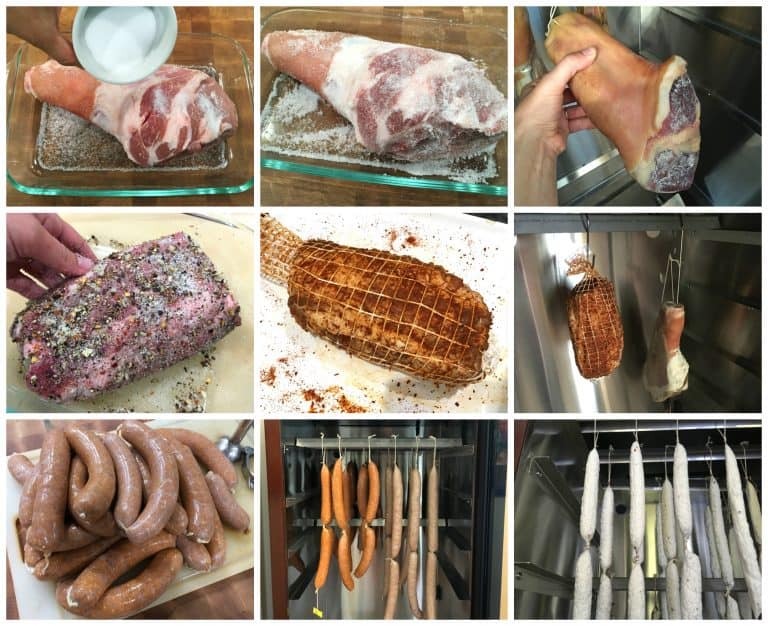 In Part I of my review I told you all about the Sausage Maker’s Digital Dry-Curing Cabinet, including a complete overview of its functions and features. 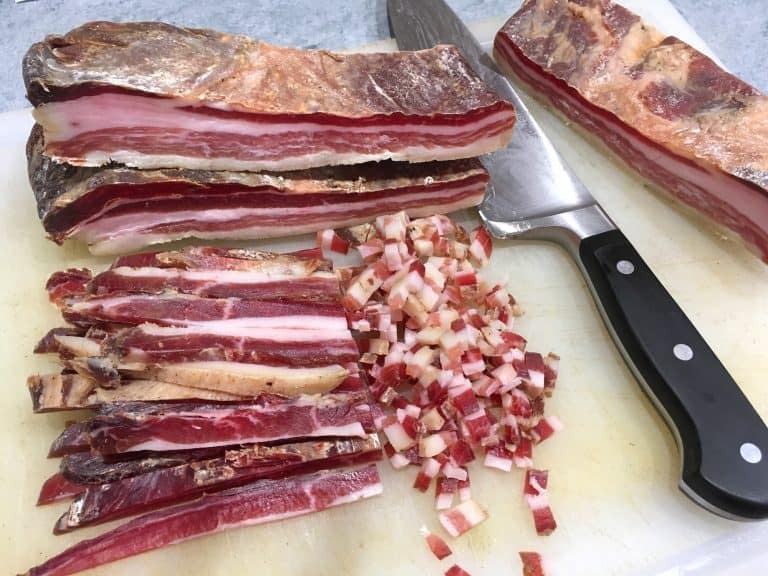 And I also promised to show you the “after pics” of my dry-cured creations. I’ve now been using this cabinet for several months and, as promised, it’s time for the dry-cured meats REVEAL! 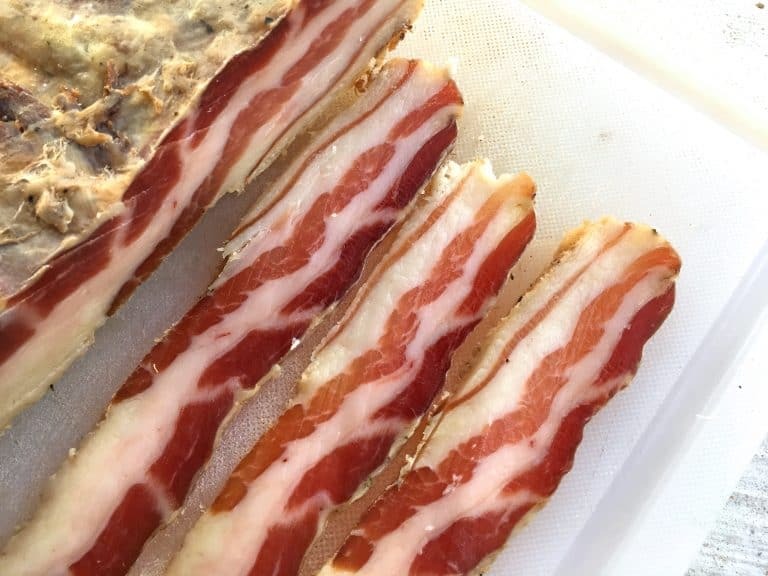 One of my first dry-curing attempts was pancetta stesa. It was a total success and WOW, the flavor of it fried up with vegetables, thinly shaved over salads and pastas, or added to a slow-cooked sauce or stew is out of this world! Since then I’ve also made proscuitto, first practicing on a smaller ham before I tackle the huge one. It’s nearly done, a few weeks left to go. I also made some Italian coppa, Spanish chorizo and Italian fennel salami. As I mentioned in my review of the Sausage Maker’s dry-curing cabinet, the ease and convenience of being able to ferment and then dry-cure the meats and sausages in the same cabinet cannot be overstated. With the touch of the digital buttons, all I had to do was adjust the temperature and humidity and the cabinet did the rest, doing a stellar job of keeping everything consistent and constant. 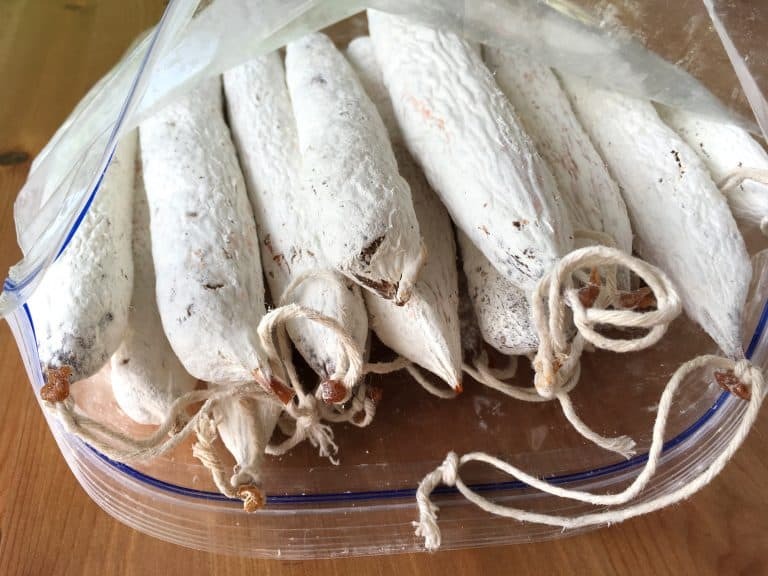 My husband and I stuffed the salami casings together, hung them up in the dry-curing cabinet, programmed the settings for a fermentation phase, and then let them dry-cure for a few weeks. The bloom (white mold) developed beautifully and there wasn’t a trace of case hardening. The flavor was incredible with such a depth and complexity you’ll never find in regular store-bought salami. We love slicing these up and serving them as part of cheese & charcuterie board for a quiet couple’s night in and for entertaining. The Italian coppa was a fun undertaking. This generously seasoned cut of pork is served in similar fashion to prosciutto in that it is sliced very thinly, almost paper thin. 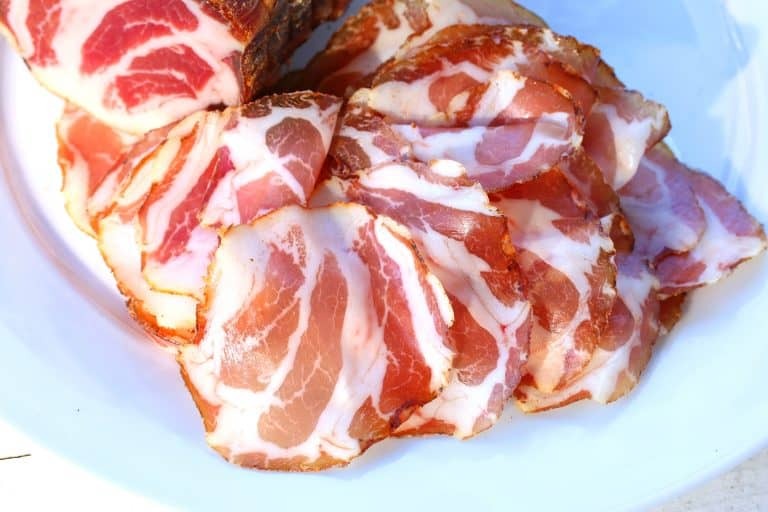 Coppa (aka capocollo) is made from a very specific cut of meat, namely from the muscle that runs from the neck to the fourth or fifth rib of the pork shoulder or neck. This cut is selected because of its unique ratio of muscle to fat which creates such a perfect marbling. Look at that! Let’s get a little more direct sunlight on it so you can see the beautiful color. I ran it through my 1970’s Hobart professional slicer that we picked up on Craigslist 10 years ago (total steal!) and sliced it super thin. My husband and kids didn’t even wait for me to pull out the baguette, butter and antipasto platter – they just started gobbling it up plain! I finally had to whisk it away to save enough for the “proper” coppa-eating experience. 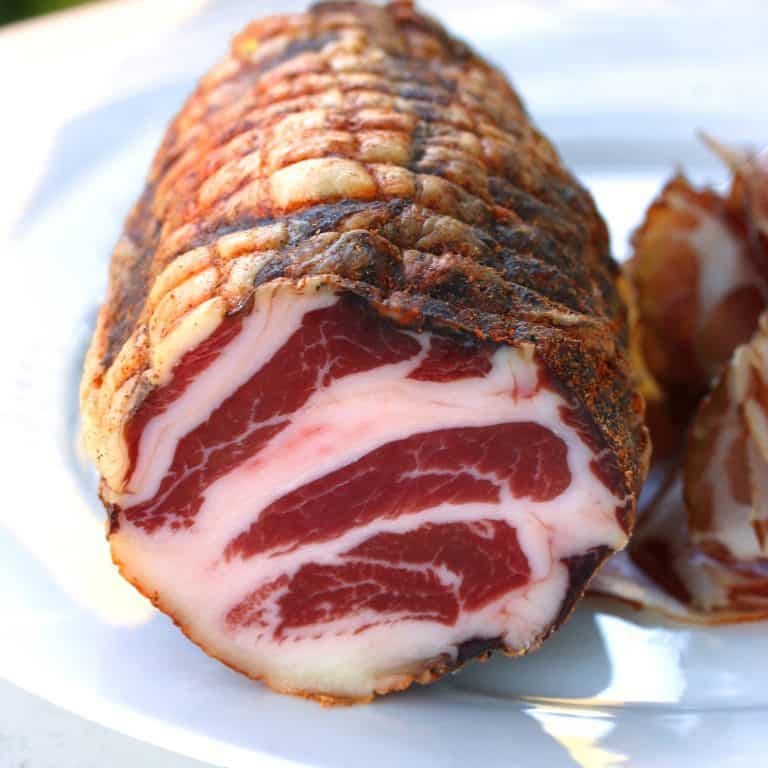 With its obvious popularity and with only a few slices left now, I’m starting another coppa tomorrow. 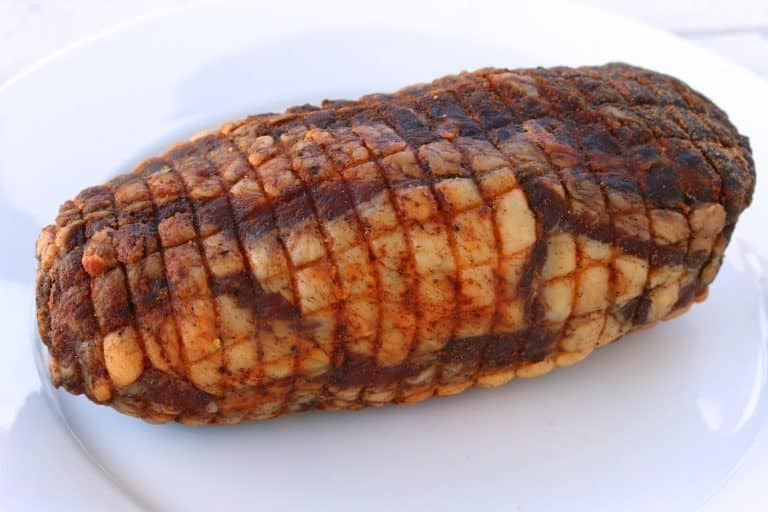 SO supple, tender and incredibly flavorful! This stuff is amazing! It cured for nearly 4 months and during that entire time the dry-curing cabinet maintained the correct constant temperature and humidity without my having to make any adjustments. I’ve been making fresh and smoked sausages for several years and now that I’m equipped with a dry-curing chamber that is so fabulously reliable and easy to use (compared to my previous DIY converted refrigerator), I am so excited to continue experimenting with the full breadth and width of dry-cured meats and sausages. I likewise can’t wait to start making hard cheeses in it! Bottom line: As I said in my Part I of my review, I am totally in love with this dry-curing cabinet from The Sausage Maker and recommend it without reservation. The ease, convenience and precision of this dry-curing cabinet makes it a total winner. For more information about the specs, functions and features of this dry-curing cabinet, check our Part I of my review. 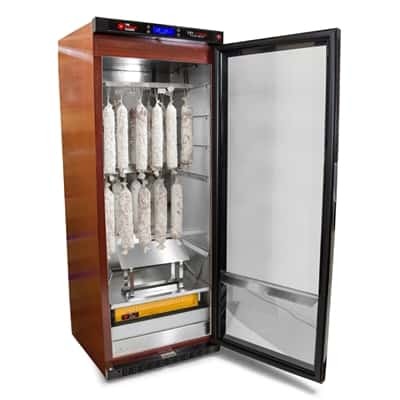 To purchase this dry-curing cabinet and to explore other fabulous products, visit The Sausage Maker. The Sausage Maker Dry-Curing Cabinet can also be purchased here on Amazon. 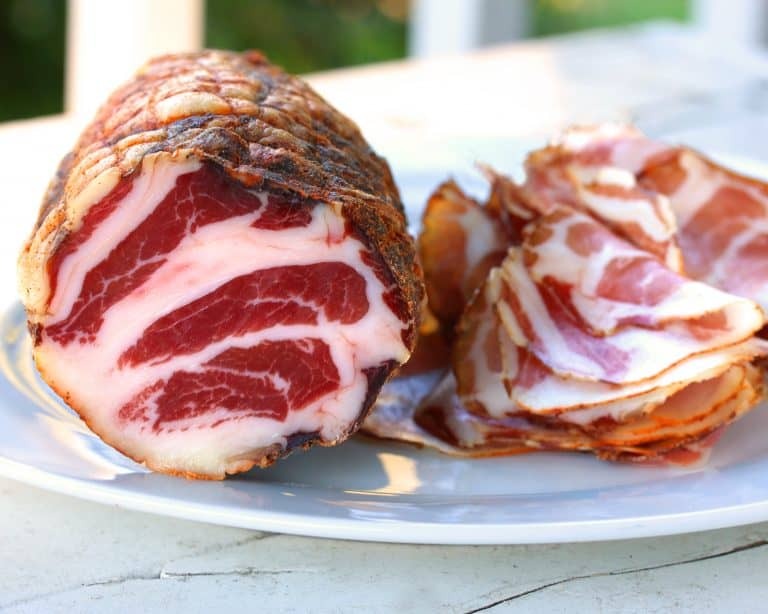 All these cured meats have me totally drooling! WOW! My hubby would love this! 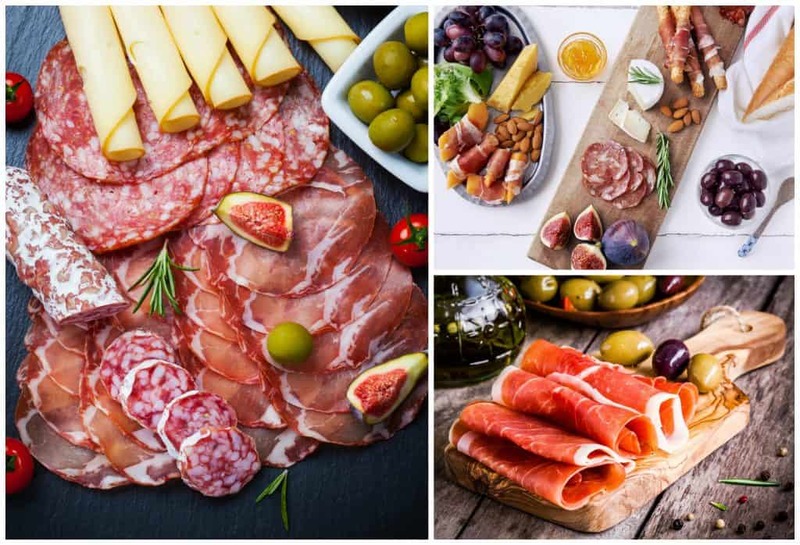 He is obsessed with cured meats – and these look delicious! I love all these ideas. They look so amazing !! That’s amazing! I had no idea there was such a thing! Completely reminds me of Spain and had no idea I could possibly make this at home. This looks like a great item to use for meats! How cool is that! I bet that smelled amazing while it was curing! That is so cool!! Looks like a great investment if you could have this appliance. I have never tried making my own but this is definitely inspiration to do so! How awesome! Love all the ideas! These look amazing! I love all of these ideas!! They look SO good!! I will be forwarding this over to my husband to take a look at this. This sounds amazing! 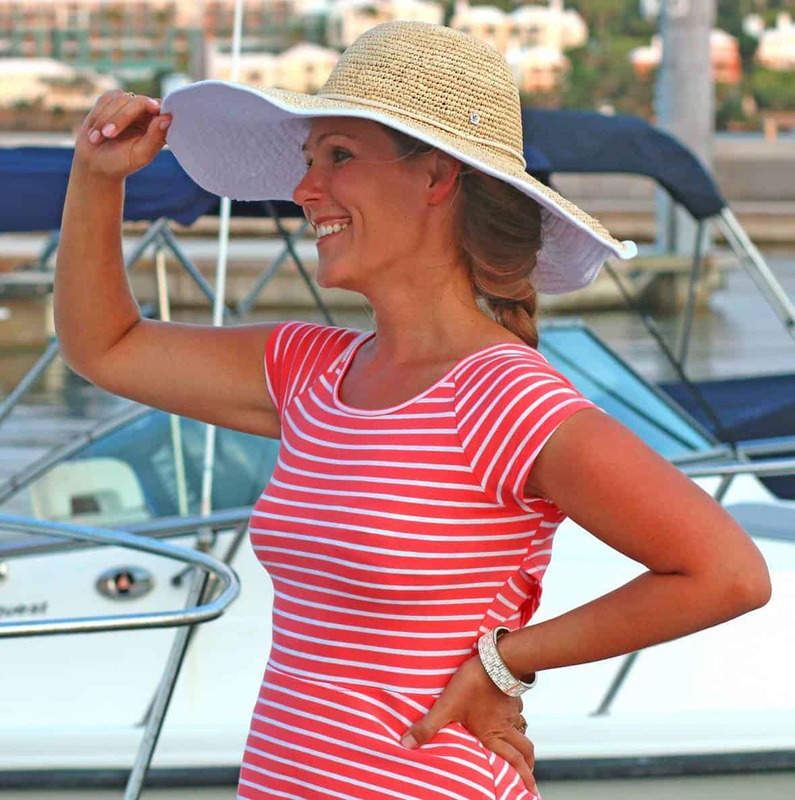 I read your first review and love that you are still enjoying its benefits. Oh my gosh this is what dreams are made of. Oh wow, I never thought of curing my own meats at home! It looks so tempting! Loving your reviews! Thanks for sharing! The only way I will believe it is as good as you say it is if you send me some of the finished product😂. I can taste it from here, I grew up with this stuff, I come from a big Italian family. Job well done. Considering that it is possible to make the homemade chamber, how much difference do we have with the digital cabinet? Is it worth to pay $3,000 extra? Hi Rodolfo, I address that very question in my review. In short, yes, it’s definitely worth it to me. I explain why and what those differences are in my blog post.